When I agreed to come on this trip, much of my enthusiasm came from the thought that I would get to learn about archaeology the very best way possible: by becoming an archaeologist myself for six weeks. That initial excitement has slowly grown over the last year, accumulating more and more as I’ve prepared, until becoming an unstoppable avalanche of anticipation for what my adventures here would entail. 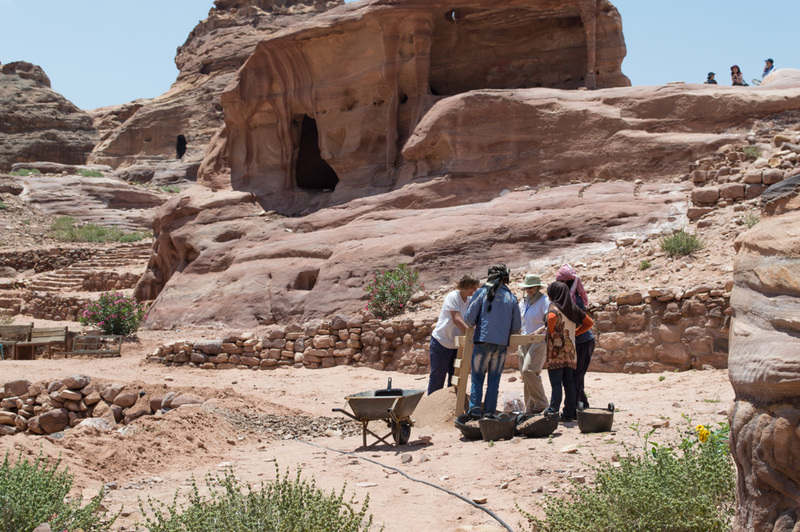 Though I’m not an archaeology major, Ancient Near Eastern Studies owes a lot to archaeology. I’ve been called the “texts person” of the group, but I certainly recognize the necessary cooperation between the book and the shovel that both lead towards the same objective. Besides, every child dreams of being Indiana Jones. Some of our equipment and site directors riding up to Ad-Deir. Our life here as archaeologists-in-training consists of the following. Every morning we wake up for an early breakfast, get ourselves and our equipment into the van, drive down the wadi to the center of Petra, load equipment unto our shoulders and a couple of donkeys, walk up nearly a thousand ancient steps to the Ad-Deir plateau, divide into excavation groups, dig dig dig, take measurements and record, collect artifacts, dig dig dig, take a break, dig dig dig. 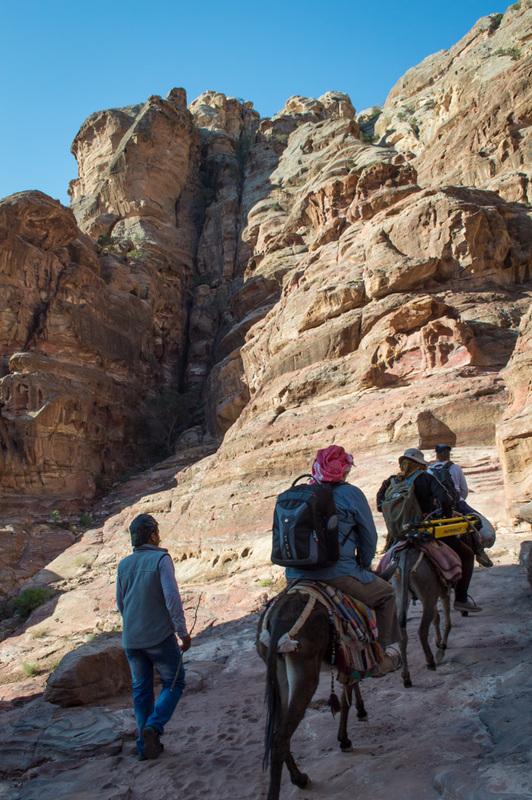 We then clean up, gather our equipment, walk back down the steps past Bedouin shops and tourists, get in the van, make it home by 2pm for lunch. Then it’s shower time and nap time, followed usually by pottery washing and diagnosis, sometimes a lecture, and dinner. It’s a rough life, but somebody’s got to do it. The sifting station for our lower trench. Really, as physically demanding as it all is, I feel so blessed to be here. I’m quickly learning way more about pottery than I ever wanted to know, and the blisters on my hands certainly don’t feel very nice, but it is such a blast to be involved with the unearthing and re-discovery of the past. I’m finding that what makes me happiest here are some of the really small and simple things: The feeling of not caring how dirty I get, the cool breeze that feels so heavenly when the sun is up high, the languages I hear around me that I can understand like Spanish and Hebrew, the surprise of finding that my water is still cold as it rushes down my throat, the simple discovery of some especially beautiful piece of pottery while sifting through mounds of dirt, and so so much more. Initial digging at one of our trenches on the plateau. Today I learned a lot of Bedouin Arabic as I chatted with one of our fellow Bedouin workers at the sifting station. All the workers call me Swelem, which is the Arabic name they decided to give me. I’m also becoming so familiar with the way up to the plateau that I like to get ahead of the group and explore alternate routes a bit. Today I took the “grand processional way,” which includes climbing a wall that clearly becomes a waterfall when it decides to rain. The climb up the long stairs is beginning to feel like a walk in the park—I was offered a donkey ride up today but decided to walk most of the way because I actually enjoy it. If nothing else, I am positive that after this trip I will be in the best shape of my life.